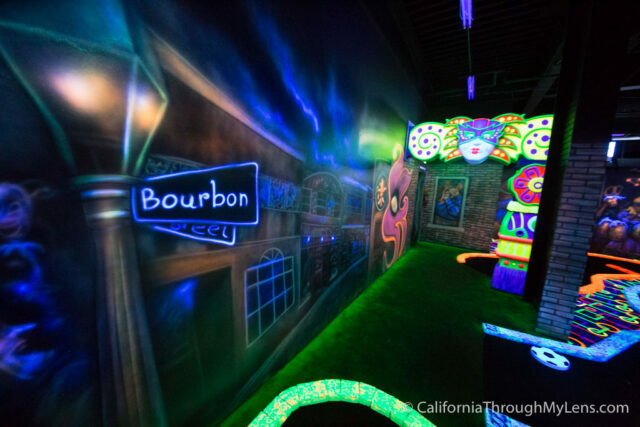 Over the last half decade, the Inland Empire section of Southern California has been adding a lot of fantastic new adventures ranging from new food options to activities. 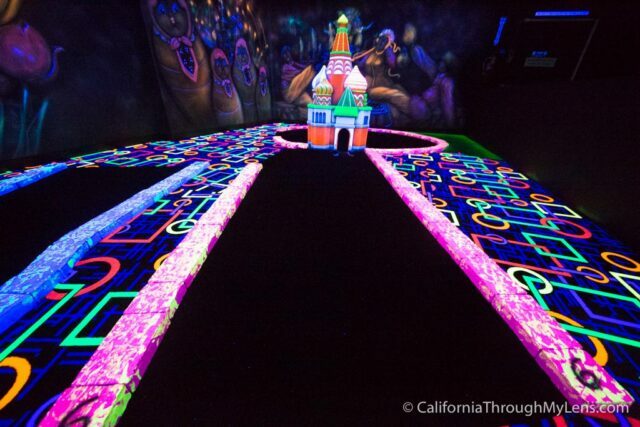 The newest of these is Glo Golf, a glow in the dark, black light mini golf course in the Tyler Mall of Riverside. 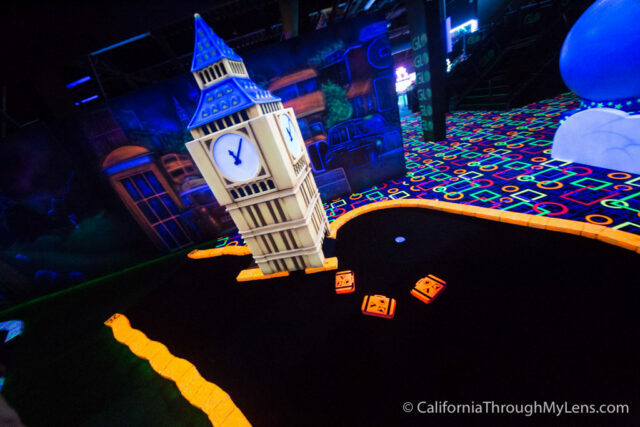 This course offers 27 holes with a travel theme that spans the globe from the Taj Mahal to Big Ben. 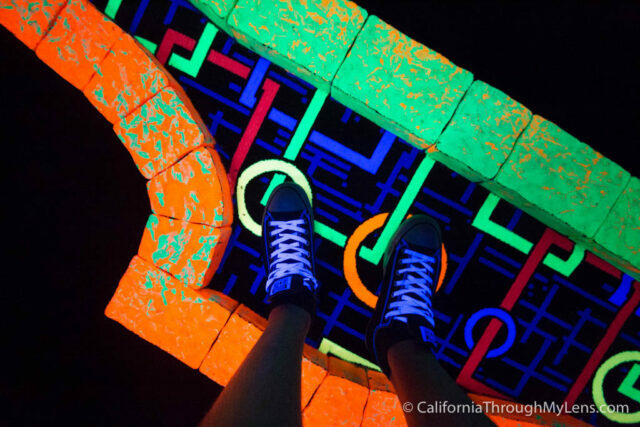 It is a super fun spot that is also wheel chair accessible, read on for all the info. I was confused the first time I went here as you can’t actually enter from the mall. 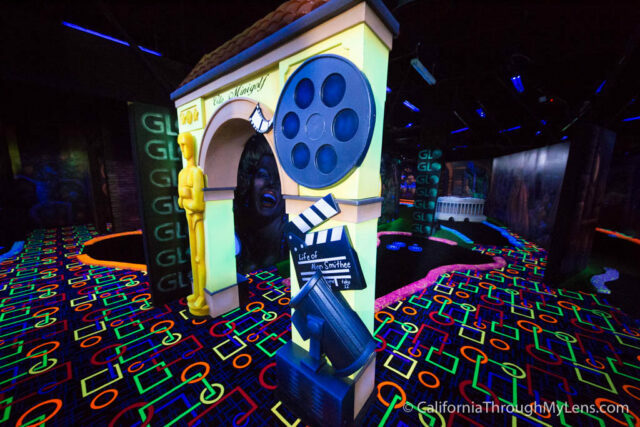 Basically you will want to park in the lot that you would park in for the food court, then from there you should see the entrance to Glo Mini Golf on the right of the mall entrance. As you can see they spared no expense on the fun world themed add ons strategically placed in the holes. 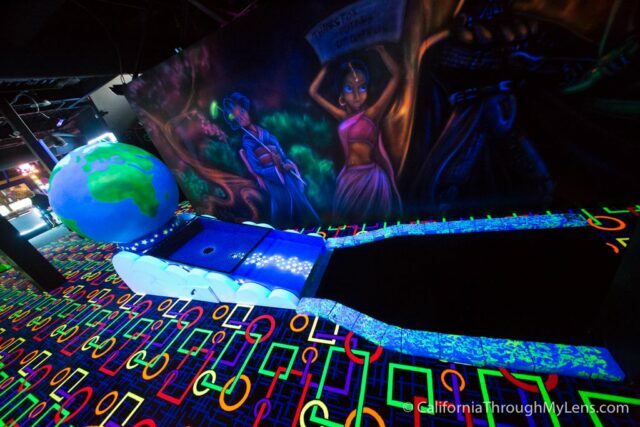 The walls themselves are all hand painted based on where you are at in the world on that specific hole. It is a super fun experience. The holes themselves have breaks in the exterior and when I asked them why that was it is because the holes are wheelchair / stroller accessible. 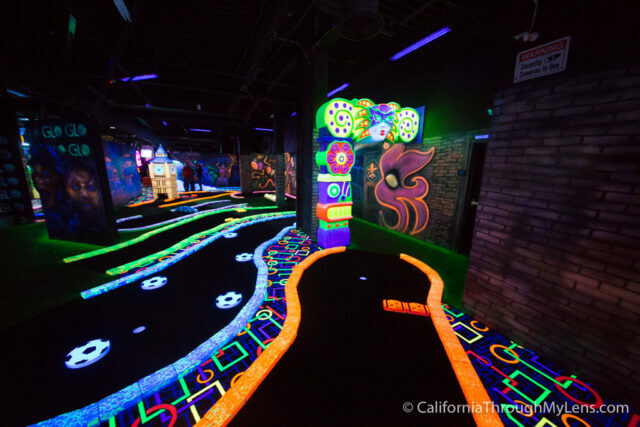 This makes the holes not very difficult as they do not have the traditional hills and hazards but it is super cool to have them accessible to all. What the holes lack in difficulty they make up for in uniqueness. 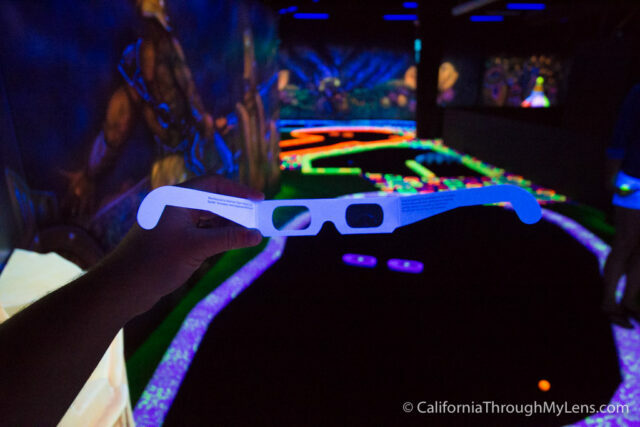 I for one have never played black light mini golf and especially not with 3D glasses. The glasses themselves are not something you can wear the whole time as they would probably make you sick, but they add a fun challenge to the game. My group switched the glasses wearer each hole so that one person was at a disadvantage each time. It makes it that much more satisfying when you hit a good shot with the glasses on. They also have RockBot which is a jukebox app for your phone that you can use to nominate and vote on what the next song to play over the speakers should be. You have to pay the app to get credits to vote on a song which I don’t love but it is a fun addition to be able to pick the music and vote on new songs with friends. 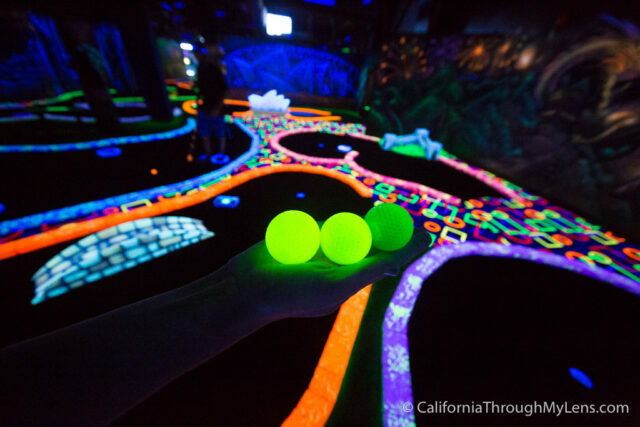 The balls themselves do really seem to glow in the black light as you can see in the above picture. 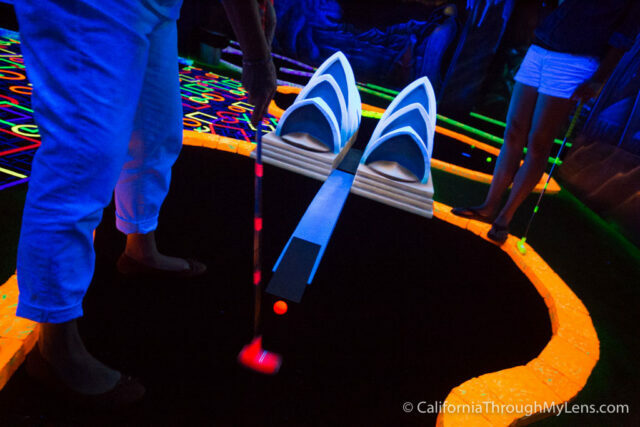 Also, make sure to wear some white as it stands out the most in the black light. 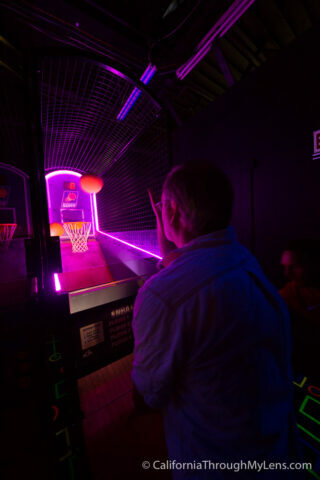 They also have arcade machines and my family was found on the basketball game pretty much the entire time we were there. They have other games as well though such as Jurassic Park and ticket games. 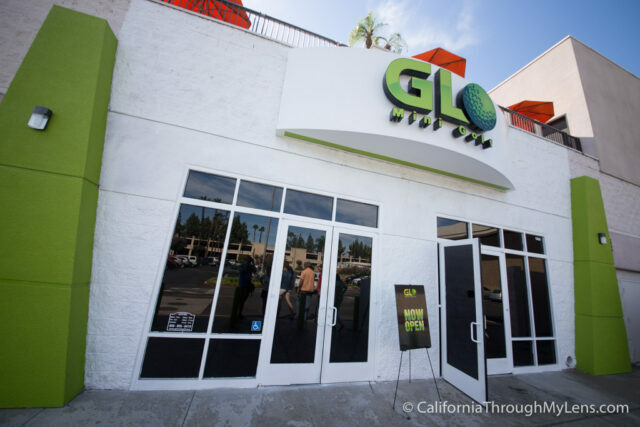 All in all Glo Golf is a welcomed addition to the Inland Empire. 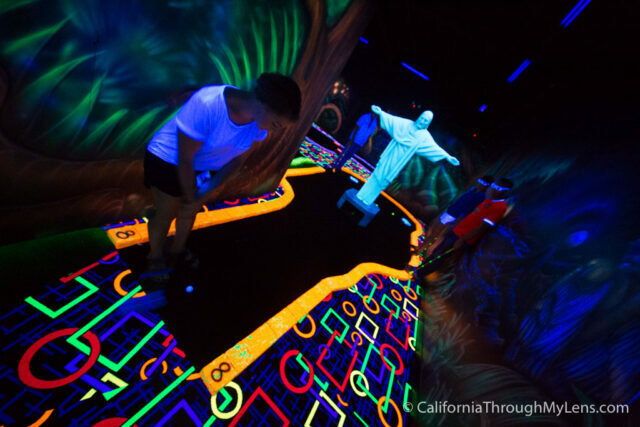 My family had a lot of fun playing through their course and I could see it being a spot where I brought other friends as well. 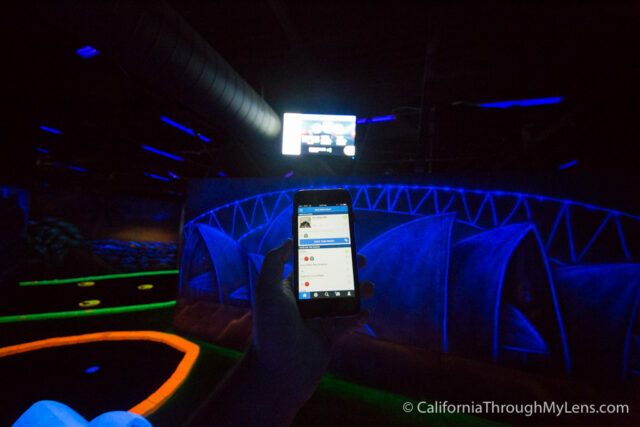 I would love to know what you think of Glo Golf in the comments. This experience was provided to me free of charge, but all opinions are my own.